With summer just around the corner, it’s the perfect time to bring colorful flowers into your modern home. This assortment of vases from the Dwell Store includes petite bud vases, iconic glassware, and sculptural ceramics—all perfect for showcasing floral arrangements. 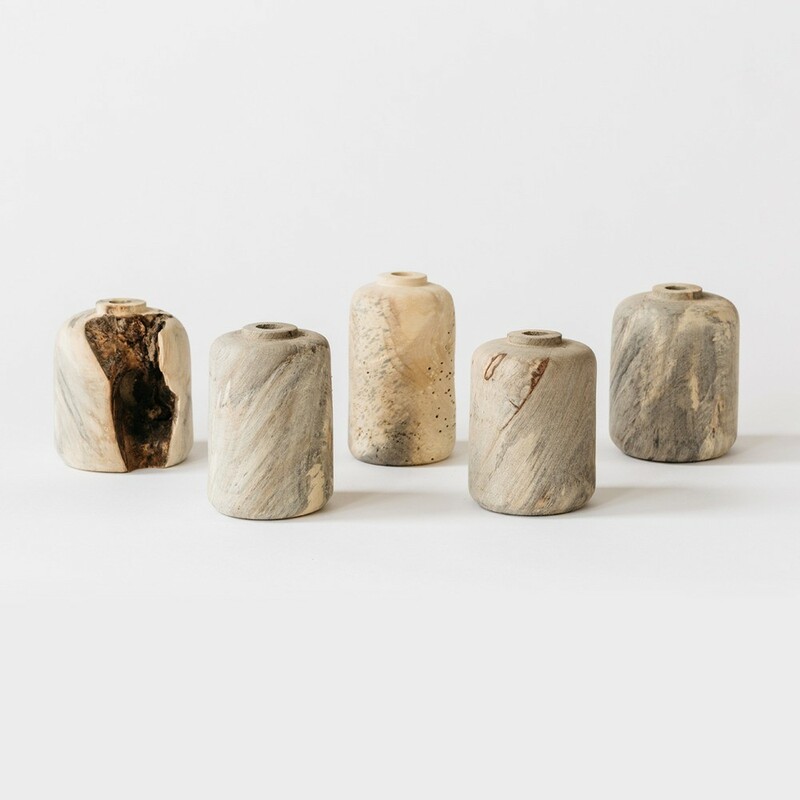 Bay Area designer Melanie Abrantes’s wood bud vases are one-of-a-kind and handmade from walnut, cherry, and buckeye burl wood. Each bud vase is made through the technique of lathing in Abrantes’s Oakland studio. The vases can hold a single flower or two, and include a glass vial to hold the water and fresh flowers. The Porcelain Vase from Edgewood Made is inspired by the process used to create it. The vase features a clear line around the vase, which occurs due to the two-part mold used during casting. The result is an embellished form that is at once simple and distinctive, and calls to the precise manufacturing process used. Drawing inspiration from the beauty of the natural world, the undulating shape of each Aalto Vase alludes to the untamed shorelines of Finland's thousands of lakes. The Aalto Vase is decidedly sculptural, making it as much a striking visual accent when left empty on a tabletop or shelf as when it is filled with freshly cut flowers. Each Aalto Vase is mouthblown in the Iittala glass factory and is designed to mimic the water that it contains, creating a distinctive and artistic accent piece. Created for Y’a Pas Le Feu Au Lac by FX Balléry, the PIK Vase is inspired by stacks of hay. Each vase is comprised of a cluster of three colorful glass cylinders that finish in beech wood cone bases. The varied heights of the cylinders creates an organic sensibility, as they replicate the variance of stack sizes found in fields. The cone bases end in small, austere points, which create the illusion that the PIK is floating slightly above the surface. Designed in collaboration with legendary designer and longtime friend Eva Zeisel, KleinReid’s Eva collection is comprised of handmade porcelain vases in several sizes. Of her many accomplishments, one of Eva Zeisel's most noteworthy contributions to the design world was helping to bring the work of female artists to the forefront. Each vase features gentle curves that move from the slender, simple form of the petite bud vase to the more curvaceous, bulbous form of the large vase. The Botanica Bud Vase Trio is a charming collection of three small vases, cast in an inviting palette of grey, yellow, and pink. These petite vases are designed to hold a large single bloom or a few buds with thin stems. The smallest vase in the trio has the widest mouth, and can hold several shallow flowers. The trio can be grouped as a traditional centerpiece or collected together on a mantel, and can also be separated and used in different parts of the home to create small accents wherever a cheerful accessory is needed. The Taper Wide Vase from Niche Modern is an elegant tabletop accessory that is available in a fleet of colors. Blending both rounded forms and angular details, the Taper Vase is defined by its geometric sensibility and dramatic look. The Taper Vase’s wide silhouette is an ideal vessel for holding short-stemmed flowers or bud flowers, and it makes a welcome addition to a dining room, living room, or bedroom interior. KleinReid’s Hawthorne Collection is crafted from handmade porcelain. Each piece is designed with classic curves, creating bold shapes. The Hawthorne Laburnum Vase is finished with KleinReid’s specially developed glaze that is hand-dipped on each piece prior to kiln firing. Once in the kiln, the glaze slowly runs over the porcelain before finally collecting in random drips at the base. The result is an imperfect edge with a three-dimensional quality that resembles cooled candlewax. The Stamen Glass Vase was originally imagined from Niche Modern’s Stamen Pendant light, a spherical ceiling light. Recast as a dramatic tabletop vessel, the Stamen is inspired by the natural forms of the flower and can house a variety of delicate blossoms. Its globular silhouette makes the Stamen vase a decorative accent that is striking, even when not full of flowers.